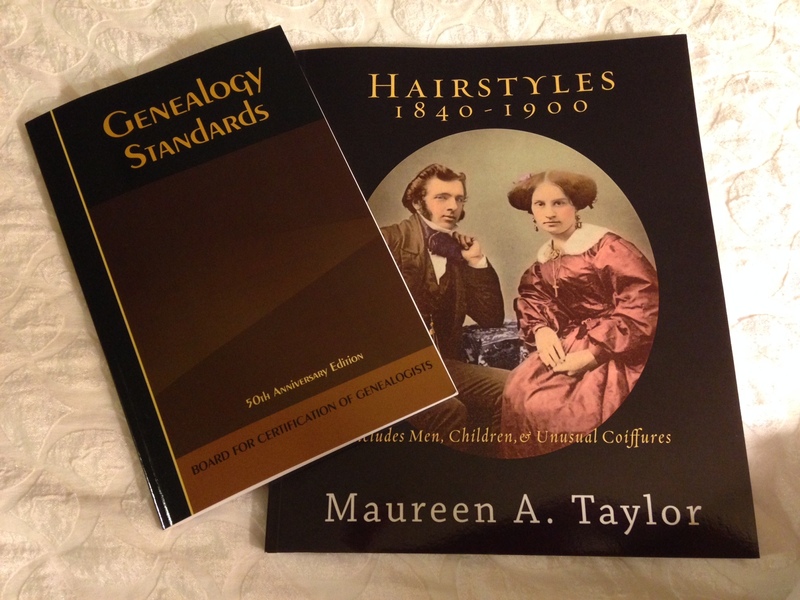 Hot off the press and available today at NGS – the new Genealogy Standards, and Hairstyles 1840-1900. I’ve been waiting for both! My husband and I arrived in Richmond yesterday. While he was out perusing the old homestead of Thomas Jefferson today, I was like a kid in a candy store, indulging in one of the greatest genealogical conferences of all – NGS. Wow! This morning’s opening session began with a keynote address from Sandra Gioia Treadway of the Library of Virgina. She described how libraries and archives must prepare to change with the times, and how the Library of Virginia plans to do just that. If Treadway has her way, in a mere seven years’ time patrons will have a substantially different experience when visiting the library. They will find themselves met by staff assisted by iPads and other technological devices, better able to help patrons find the materials they are searching for. It is an exciting era, that’s for sure. The exhibit hall was quite packed with the usual vendors and service providers – FamilySearch, Ancestry, NEHGS, Find My Past, My Heritage and many more. Lisa Louise Cooke, Maurine Taylor (aka the Photo Detective) and Janet Hvorka with Family Chart Masters shared a booth and provided “out of the box” educational sessions. Looking forward to another jam-packed day tomorrow, learning from the experts and the best in the field of genealogy! This entry was posted on Wednesday, May 7th, 2014 at 8:59 PM	and posted in Uncategorized. You can follow any responses to this entry through the RSS 2.0 feed. Oh this sounds so interesting! I would love to go to the national one someday. Went to one held by the Connecticut Society of Genealogists with my father many years ago.